simply worn out and can not be reused. is that toner dust presents an all too familiar explosion hazard for typical shredding and separation processes. It is also very expensive to adequately capture nuisance toner dust if the process is manual. Several years ago Innovative Recycling (a division of Innovative Applications Corporation) in El Paso, won a competition from one of the major laser printer companies to develop a process designed to solve this problem and meet its recycling needs. The result led to a unique, and very cost effective process that is now recycling 1,500,000 pounds of laser cartridges per month for several printer brands. The process yields clean and pure streams of separated plastics and metals ready for reuse in other products. Innovative Recycling has patented several key processes in their system which is now in the process of being modified to accommodate Ink Jet Cartridges. This new process for Ink Jet Cartridges is expected to be up and running during 2010. Need a way to recycle laser cartridges that you can’t use? 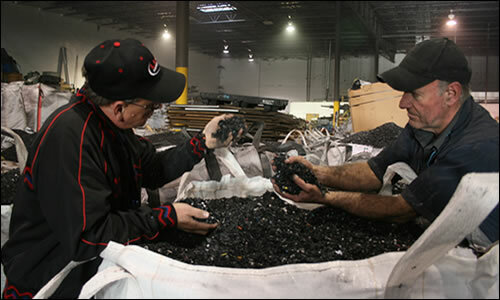 Innovative Recycling has developed a novel process that can meet that need. The process is fully automated and yields clean raw materials ready for reuse in other products. The El Paso, Texas operation is also reported to be the world’s largest recycler specializing in laser cartridges. Innovative Recycling is also working on a process for recycling ink jet cartridges that they expect to have ready before year end 2010.